A lovely day full of sunshine! Walking shoes on, thermoses filled with ice and water, cameras packed, and the map in hand; off we went to explore the historical city of Nimes. 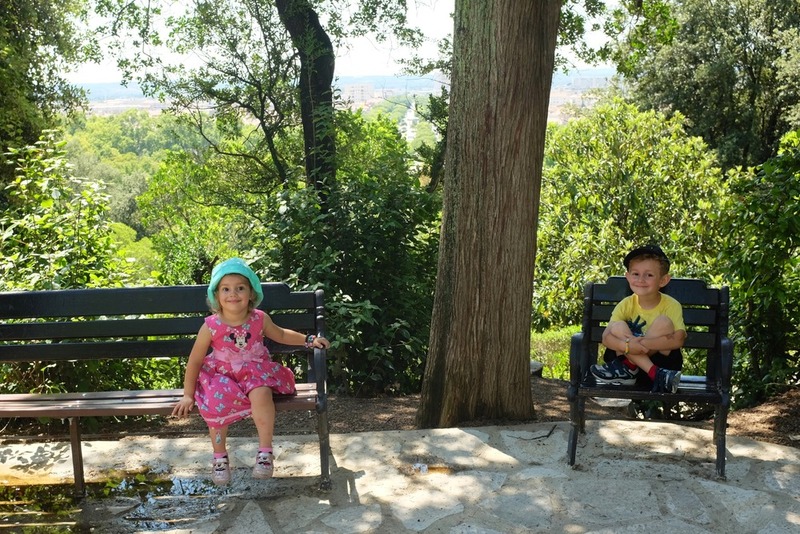 We started off by heading to Les Jardins De La Fontaine. "Economic growth from the seventeenth century onwards caused the city to expand. Entrusted with the tasks of displaying the Roman remains discovered close to the spring and improving the water supply, Jacques-Philippe Mareschal, the King's engineer, planned the creation of new districts with a layout in line with the axis of the garden." The gardens are beautiful, with many statues. 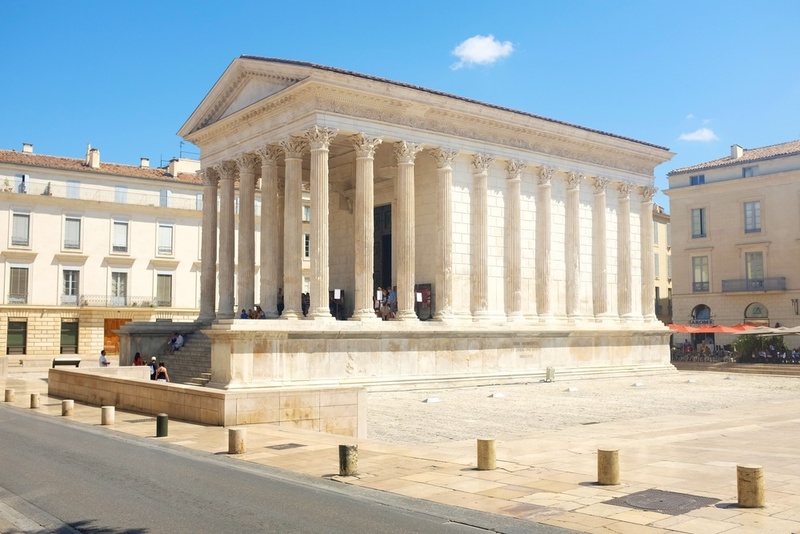 As well as historical structures such as Temple de Diane, which was built around 25 AD. But the coolest aspect of the gardens, in my humble opinion, was La Tour Magne, built around 15 BC. The tower is perched up on the top of the hill, where you can see a panoramic view of the city of Nimes. The walk to the top had multiple, criss-crossing paths which you can choose from. We picked the closest path, and the way up was steep in parts and very very hot! "Like a signal of the city, a symbol of Roman power, this tower in the Roman fortifications is at the highest point of the town. It was built on a tower in the ramparts of the previous Gallic settlement. An L-shaped ramp led via the rampart walk to a stairway to the top of the 'big tower'. In Roman times, the tower had an extra level." Since we really wanted to see the view from the top, we paid (yes everything costs money) for tickets to climb 140 steps to the top. The view was definitely worth the hike and the stair climbing. Even the kids were both wowed by how much we could see. All done with seeing the views...heading back down. "Around 15 BC, the Emperor Augustus enclosed the colony of Nimes within 7-kilometer-long city walls. These ramparts guaranteed the city's defence but, more importantly at that time of Pax Romana, officially marked out the city's perimeters. This enceinte included almost 80 defence towers, amond them the Tour Magne, and counted 10 gateways, 2 of which are still visible today: the Porte de France and the Porte d'Auguste through which the Via Domitia (A military road between Rome, Gaul, and Spain) entered Nimes." Since there are so many different paths that lead up to the tower, on the way back down we took a new path and discovered a small waterfall. Kian had blast soaking his head under the fall to cool down. On the way down the stairs we also were able to see a wonderful view of the complex architecture of the gardens. Once out of the gardens, we found a place to eat lunch before continuing our adventures around Nimes. Next up, the Square House, or otherwise known as Maison Carree, built around 16 BC. 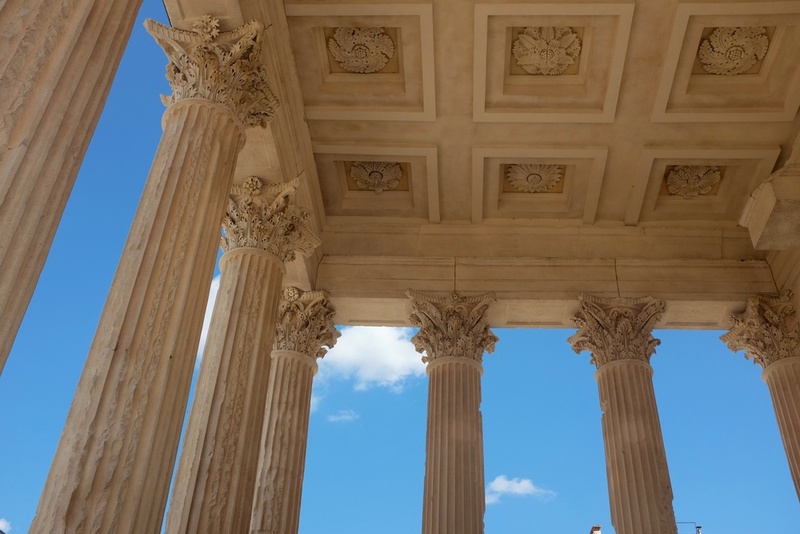 "Over the centuries, the Maison Carree has never ceased to be used. It still remains one of the best preserved temples of Roman civilization." Inside, there is a small movie theater where we watched a short film in French (with English subtitles thankfully) about how the city of Nemausus (The original name of the city of Nimes) came to be. In summary, a warrior from the southern tribes of Gaul joined Julius Caesar to lead a group of 500 men against the northern tribes hoping they would receive allegiance from the Romans. After 25 years in battle, he was rewarded richly, and allowed to return home and build Nimes to be modeled after the finest Roman cities. As part of the movie, they also showed the Arenes (the Arena), where the gladiator fights were held. Which was perfect since that was going to be our next stop. "Built around 70 AD, it was remodelled in 1863 to serve as a bullring. 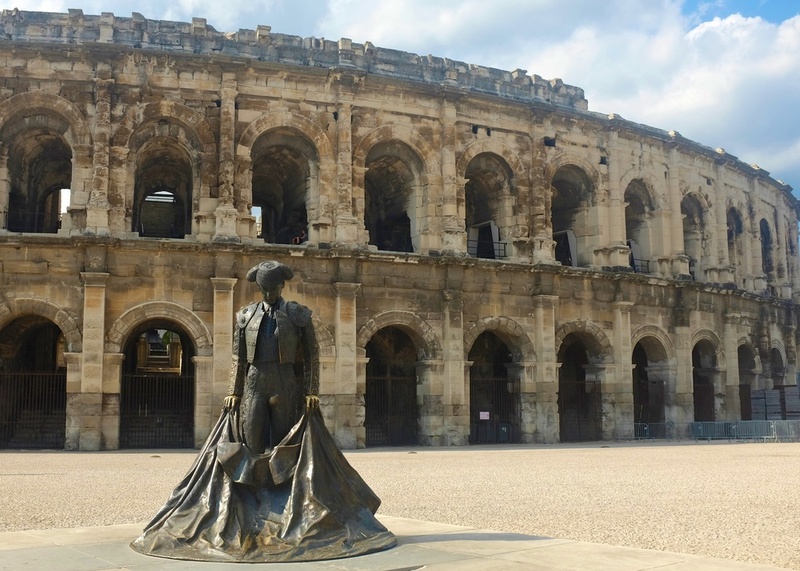 The Arenas of Nîmes is the site of two annual bullfights during the Feria de Nîmes, and it is also used for other public events." It was a short walk from Maison Carree to the arena, and it really was a very amazing structure to witness. We had gotten one of those audio tour headphone devices as part of the admission, and just wandered around, listening to parts of the history. The whole thing can easily take about an hour and a half if you listen to the whole thing, but of course with kids we were just listening to parts before moving on. As you walk around, there is a general path to follow, but for the most part you can walk anywhere that isn't blocked off. After walking mostly around the lower areas, we saw a lot of people had climbed all the way to the top, and were walking along the perimeter to see the view of the city. To get to the top, you have to climb (very carefully) the tall "seats"/stones to see the view. So of course, that's exactly what we did, and were rewarded with great views, both inside the arena and out. View of the interior from above. The stage is setup for summer concerts which they hold here. After the Arenes, the kids were tired and hot, so we rewarded them for being such good walking buddies. 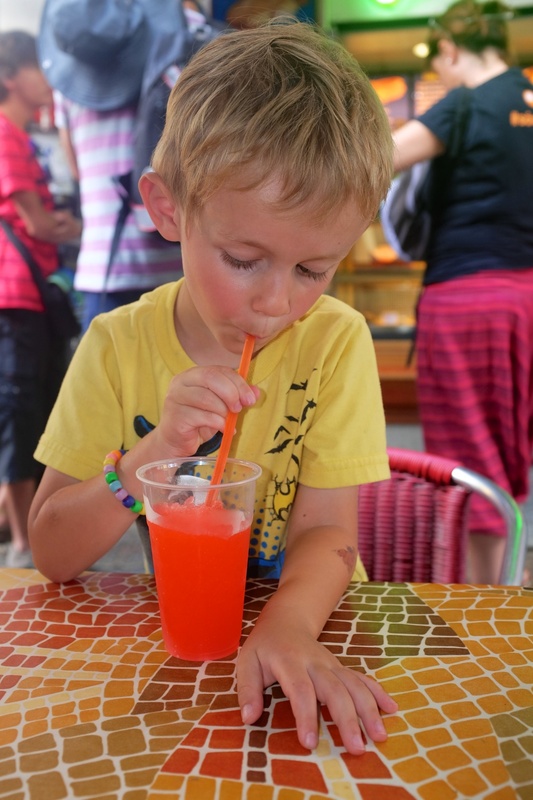 We stopped at a hole in the wall shop called 'Croc Show' (more on the significance of the crocodile in Nimes in the next post), where Kian picked cherry slushy and of course Hannah chose strawberry ice cream cone. We started our walk back home after everyone had a few minutes to cool down and rest their legs. We were lucky to walk right by La Porte De France, one of the two standing gates of the original wall that surrounded Nimes. As we got closer to our street, we saw lots of kids playing in the fountains which are part of the long walkway that leads the Les Jardins De La Fontaine. Hannah really, really wanted to stop and play too, and we said sure, because well...why not? Hannah: These fountains are tricky! We had to peel away a sad Hannah from the fountains as she had no intentions of leaving. But after walking around the town for almost 8 hours, we really had to get back home to make dinner.